TV Legend Norman Lear on the Black Panthers, Nixon’s Enemies List & What Gives Him Hope | Democracy Now! veteran television producer and political activist. The new PBS American Masters documentary about his life, Norman Lear: Just Another Version of You, chronicles his life. Lear is also founder of several nonprofit organizations, including People for the American Way. We continue our conversation with the 94-year-old legendary TV producer Norman Lear, the focus of the new “American Masters” documentary, “Norman Lear: Just Another Version of You.” We spoke to him in studio last week about how his work landed him on Richard Nixon’s enemies list, the Black Panthers and what gives him hope. 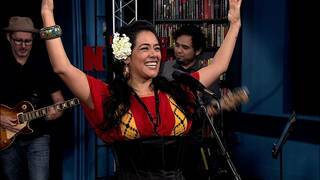 Web ExclusiveJun 29, 2017Mexican Singer Lila Downs in Conversation & Performance on Democracy Now! AMY GOODMAN: “Those were the Days,” the theme song to Norman Lear’s hit show All in the Family. This is Democracy Now!, democracynow.org, The War and Peace Report. I’m Amy Goodman, as we return to our conversation with the television producer, longtime political activist Norman Lear. Tonight, PBS will premiere the American Masters documentary, Norman Lear: Just Another Version of You, the first documentary about the 94-year-old legend, who, because of his work, landed on Richard Nixon’s enemies list. I asked Norman Lear how he ended up there. NORMAN LEAR: Empire. It was—it was Nixon at his—at his Trumpish. AMY GOODMAN: So, you have Bea Arthur playing Maude. AMY GOODMAN: You have Carroll O’Connor and Jean Stapleton, this astounding duo. Talk about them as people and your work with them—Carroll O’Connor very much, to say the least, the absolute opposite of Archie Bunker. NORMAN LEAR: Yes, Irish Catholic liberal. AMY GOODMAN: And how could he tolerate doing this? NORMAN LEAR: He must have had a very difficult time, in two ways. One, as an intellect, he was speaking like somebody—the antithesis of a smart man, let alone an intellect. And he didn’t like most of the scripts. And the best example of it was—and we have it in the American Masters documentary—a story that took place entirely in an elevator, a half-hour in an elevator, stuck between floors with a Hispanic woman who was about to give birth and who, in the fearful moment of a stuck elevator, did give birth. And I wanted to see that baby born on Archie’s face. I just was in love with that from the moment that it dawned on us to do something like that. AMY GOODMAN: Of course, he’s turning away at the beginning, turning away. He doesn’t want this to happen. NORMAN LEAR: Yes, yes, yeah. Because she’s Hispanic, he’s saying, “Stoppo! Holdo!” But when it finally happened, the expression on Archie’s face when he hears the baby cry—first, he’s alarmed the baby isn’t crying. Then the baby cries. AMY GOODMAN: “Make that baby cry.” And you see him, out of the corner of his eye, starting to look. NORMAN LEAR: Yeah. Then he says, “It’s a boy.” And I don’t know. Golden. Golden. AMY GOODMAN: Good Times and The Jeffersons. AMY GOODMAN: Talk about the Black Panthers coming to visit and this show, Good Times. NORMAN LEAR: Well, the Panthers came simply to say, “The only black man on television with a family has to work two and sometimes three jobs, Can’t you”—you know, it wasn’t anything like “can’t you.” They just damned us, because, you know. But what came out of that was we have the Jeffersons next door. We’d only just found what’s-his-face to play George Jefferson. And I knew we were going to have something great. And we decided, as a result of that, we’ll have him move on up. We don’t have to do a black family as—we’ll do one that—you know, he was in the cleaning and drying business. Now, suddenly, he’ll have three or four stores, and he’s moving on up. NORMAN LEAR: Sherman Hemsley, yeah. And it was Ja’net Dubois, who played the neighbor on the show, who came up with the song “Moving On Up,” which is kind of an anthem. I hear it everywhere now. AMY GOODMAN: You did a lot of television. You changed television. But you also started the advocacy group People for the American Way. I daresay if you were starting new organizations now, given this presidential election year, you might be doing the very same thing. But talk about what is People for the American Way and why you moved away from TV for that for a while. AMY GOODMAN: Extreme—I mean, he was a real powerhouse on radio. NORMAN LEAR: A powerhouse, yes, a powerhouse. And he had raised anti-Semitism, you know, to an enormous height. But I had my civics class, which taught me I was protected by the documents that came from our Founding Fathers. I underline the word “Fathers,” because mine was away. I think that’s the time I fell in love with Founding Fathers, looking, needing, wishing for a father. NORMAN LEAR: Yeah, America Divided. AMY GOODMAN: America Divided series. And I wanted to play for a moment America Divided, where you are the correspondent investigating gentrification and displacement here in New York City, then going undercover to expose racial discrimination in housing. In this clip, you speak with The New York Times investigative journalist Nikole Hannah-Jones. NIKOLE HANNAH-JONES: And then you have this myth that if a lot of black people move into a neighborhood, the property values go down. That’s actually true. It’s true, though, because of the way the federal government rated integrated neighborhoods. But we’ve come to believe it’s true because black people just don’t keep up their properties. So you see the way that a reality can be fueled by a myth. NORMAN LEAR: Reality can be fueled by a myth. NORMAN LEAR: And is our government doing anything about that? NIKOLE HANNAH-JONES: Well, we have fair housing laws now. We don’t have fair housing yet. I don’t think we realize how much effort went into creating segregation. We had cooperation from individual homeowners all the way up to the federal government to reorder our society in a way that harmed black Americans and helped white Americans. So you have to break it up. You have to do what you did to create it. NORMAN LEAR: Oh, thank you. AMY GOODMAN: —episode of America Divided that’s now on Epix. You came home, in a sense. You lived here in your life in New York. AMY GOODMAN: When were you here? NORMAN LEAR: I was here when my father got out of prison. We came to New York. We lived here for about two-and-a-half years. I went to Weaver High School. No, that was in Hartford. I went to Tilden High School. AMY GOODMAN: Samuel Tilden High School. NORMAN LEAR: Yes, Samuel Tilden High School. AMY GOODMAN: And here you’re exposing what the Black Lives Matter movement talks about a lot. I mean, they’re talking about, you know, African Americans killed by police officers, but structural racism in our society, and housing is a crucial part of that, how segregated we are. New York, what, like the third most segregated major city in this country. NORMAN LEAR: Well, and it’s one thing to read about it and understand it’s going on. It’s quite another thing to go into it, to sit in a lobby of a building with 14 or so tenants, family representatives, who are—were paying $600, are now paying $1,900 or something, crazy figures, escalated rentals. And they still were wanted out because of gentrification. And so, because they had long leases, the landlord had chosen to “fix,” in quotes, these steps, this wall, that thing—all to cause dust, raise debris and so forth. And people were getting sick, literally getting sick. And I’m sitting with these families and—I mean, the wonder is that I raided my refrigerator last night and had a good night’s sleep. How do we human beings live with that? NORMAN LEAR: —for me. And there was nothing for him, one day later. AMY GOODMAN: And you go in one day later. How did you feel about this? This is not back then. NORMAN LEAR: I feel terrible. AMY GOODMAN: This is now. NORMAN LEAR: You know, I do not understand about how I can feel the way I feel, do what I do, but it is nothing compared to what has to be done. I don’t know why I’m not out on the streets. I don’t know why I haven’t been arrested yet. I don’t know why enough is not enough. AMY GOODMAN: What do you still want to accomplish, Norman Lear? NORMAN LEAR: Another hour and a half talking to you. AMY GOODMAN: Well, that would be a pleasure, but I think there is a person who’s waiting to take you out right away. But as you take on all these issues, what gives you hope? NORMAN LEAR: I don’t know. Congenitally, I don’t want to wake up any morning I’m without hope. I mean, that’s where I—I see hope in your face. I see hope in the person who greeted me coming in. You know, I don’t wake up in the morning without hope. AMY GOODMAN: Norman Lear, veteran legendary television and film producer, political, social activist, philanthropist. The new PBS American Masters documentary, premiering tonight, is called Norman Lear: Just Another Version of You, chronicling his life and the creation of the hit shows All in the Family, Good Times, Maude, Sanford and Son and The Jeffersons. Norman Lear is founder of several nonprofits, including People for the American Way. This is Democracy Now!, democracynow.org. That does it for our broadcast. I will speaking on Thursday at 7:00 at Arizona State University in Tempe at 7:00, then on Saturday morning here in New York at the New York Press Club’s 2016 Journalism Conference at the Kimmel Center. I’m Amy Goodman. Thanks for joining us.